Citizen Patrol Volunteers take on an active role in the community. They provide a positive visible presence in their neighborhoods and serve as a deterrent to criminal activity. By joining together, they show they care about each other and about what happens in their neighborhood. People that live in a community have firsthand knowledge of who does and doesn't live there and are a great aid as "Eyes & Ears" for police. Saskatoon Police members provide them with the skills needed to be able to report and document suspicious activity accurately. Become a Citizen Patrol volunteer. It takes a positive attitude, enjoying fresh air and exercise, and becoming acquainted with the neighbors by walking, riding a bike, jogging or driving around the neighborhood. Volunteers work in teams, are identifiable by their vests, and carry a flashlight and cell phone. 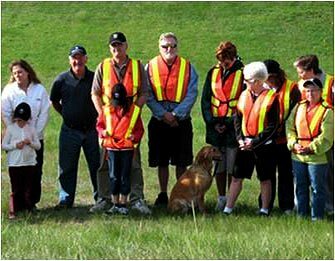 Citizen Patrol Volunteers patrol parks, schoolyards, strip malls, and residential areas in their community. They invest as much spare time as they have to offer, one hour at a time, or more. Join today and teach our future generations the value of community and the responsibility we all have in creating or maintaining a community in which we want our children to raise our future generations in.